Is the Grand Canyon an Ancient Metropolis? In the year 2012 while studying the formation theories of the Grand Canyon, I thought to superimpose the stars of Orion to the high altitude marker points on the Grand Canyon park's major monument peaks with the hope for a matching alignment. I felt successful in doing so. Later that year, I found that the Pleiades star pattern matched monuments just to the west of Orion. Having found two star systems helped to rule out the possibility that a single match was coincidental. Following is an image example showing ORION superimposed over major monument peaks, Isis Temple, Cheops Pyramid and the Tower of Set, etc. The Pleiades correlates to the monuments Tower of Ra, Osiris and Horus Temples to the West (alignment pattern not shown here). 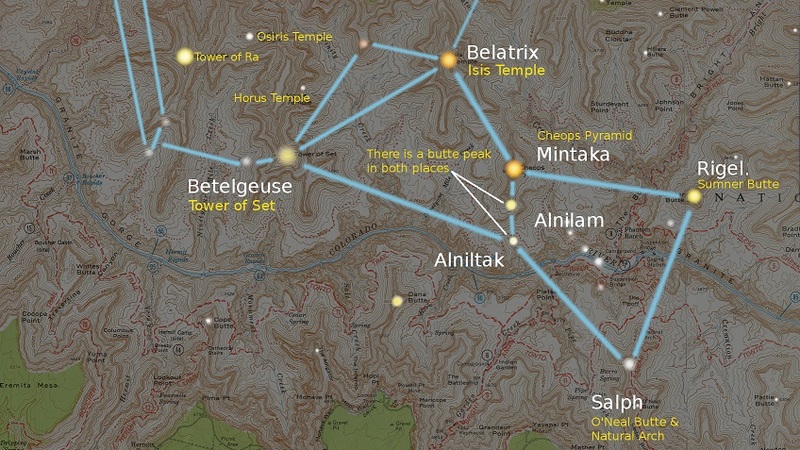 While the Great Pyramids of Giza have been found to correlate with the belt stars, Mintaka, Alnitak and Alnilam, I discovered that Salph, Betelgeuse, Belatrix, and Rigel, have a striking correlation within the Kaibab Plateau. If I were to name it, I'd call it "Antediluvia"
I'd like to share this and other ideas with people who partake in the search for ancient civilizations and the antediluvian truth. In this particular case, the possibility that the canyon may very well be a metropolis hidden in plain sight would prove a time scenario broader in scope than Atlantis as well as other pyramid discoveries. Other canyons are not discluded from this theoretical approach. We understand that the historical record is distorted which is most likely veiled in secrecy. I am attempting to establish solid evidence based on logic which defies the standards of science with a supported compelling argument I wish to present in the mainstream arenas. The Great Deluge a real component of the formation formula? If there is merit to the star pattern alignment to the monuments, and if this is true, it makes possible that a neo-formation concept is the basis for the antediluvian model of what appears to be a city, not a naturally formed canyon. The Colorado River and tributaries have never been absolute proof to the canyon's form, but because it may simply be the removal of the soft mud, sediment, and debris brought about by a great deluge is the answer. It would explain how the ancient sea bed that has long since receded settled around an engineered city and then was removed. This then is the story of a revealing of a civilization over an expansion of time after a devastating flood. In the past, researchers have drawn up theories as to how the canyon was formed. One theory suggest an epic in scale electrical (EMF) storm, and or, in combination with tectonic earth raised during a plate shift. However, using a single star alignment as evidence of intellect may negate what was previously only notions not based on solid fact. If one measures the horizontal striations, it is inconceivable that the entire plate that the monuments rest are almost perfectly level. One side would be up and the opposite side down. A river couldn't have done all that! Could it? An explanation other than a naturally sculpted terrain seems more logical. The new formation idea is simply the removal of non indigenous earth in what appears to be a natural occurring excavation of what was previously there. The formation angles of the canyon walls, the 'stepping' buttes, and the appearance of blocks with 90 degree angles that make up the buttes we observe today may indeed be engineering constructs designed and created. Why do the monuments of the Grand Canyon not exactly resemble the pyramids of Egypt? These and many others are questions I have covered and documented as possible answers in my research yet to be published as a book. Note: I am curious as to who may have read this post and find it unique? Or, must it pass an opinion approved process, or endorsed to inspire interest? Thank you! Edited 7 time(s). Last edit at 23-Jun-16 20:40 by underwinger.